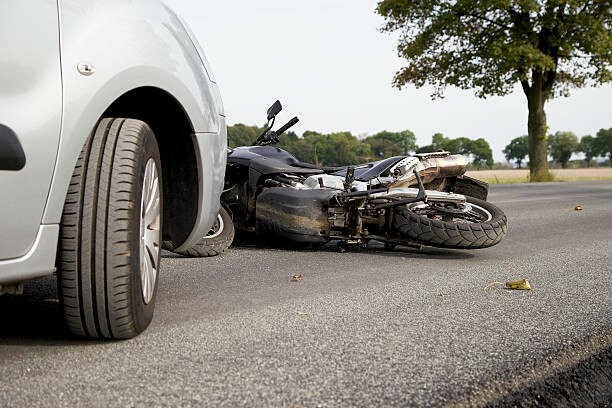 If you want to know what to do after a motorcycle accident, there are some critical steps to take in order to assist your claim. The moments after an accident are essential, and can impact your future legal actions and rights. Here are the most important steps you should take immediately following a motorcycle accident. Once everyone is safely out of the roadway, exchange information with anyone else involved in the crash. Get the name, address, phone number, insurance information, and license numbers for all drivers. Take a photo of the vehicles, and write down the license plate numbers, car make and models, and a description of any vehicles involved in the accident. Keep these notes organized, because if there are multiple parties involved it’s possible to mix up one person’s insurer or vehicle with another. Step 2: Call the Police. Call 911 to get police to the scene of the accident as soon as possible. If there has been property damage (anything over $500) be sure to file a police report. If you or anyone involved has been injured, be sure to request medical attention. The police report can be vital in your efforts to recover for damage to your bike, clothing, or for physical injuries – many of which may not become evident for hours, or even days after an accident! Letting the police know there was an accident is important for building a case. The police officers will keep their own records of the event, which can be referenced later. Be sure to take down the responding officers’ names and badge numbers. This will help your attorney follow up with to collect any necessary information for your claim. Step 3: Take Note of your Surroundings. Documenting the scene may be difficult if you were seriously injured, but try to take notice of important information about the accident. This includes where, when, and how. Specifically, try to take note of the location of the accident, road conditions, speed limits, weather, lighting, the direction of travel any vehicles involved. Mark down or photograph the nearest intersection, and mile marker. This will allow you to return later to take photographs and document the scene. Step 4. Talk to Witnesses. Eyewitnesses to an accident are important in any legal matter. If it’s possible, try to interview everyone who witnessed the accident, and record their observations via an audio recorder on your phone, or by writing it down on a piece of paper. Memory fades quickly, so collect as much as you can while the incident is fresh in the mind of any witnesses immediately following the motorcycle accident. Get their contact information in case you or your lawyer needs to interview them at a later date. Step 5. NEVER Admit Fault! When two people bump into each other, it’s not uncommon for both parties to quickly apologize. This is part of human nature. If you’re involved in something as jarring as a motorcycle accident, you may apologize to the other party without thinking. Many times, the exact cause of an accident is unclear immediately after the accident. People are sometimes tempted to apologize for getting into an accident, even when it’s not their fault! Also, people sometimes “agree” with a version of events given by an another, even when it’s not accurate. Accidents can be jarring, and you might not recall every detail until hours or even days later. Be careful what you say: statements at the accident scene can have serious legal consequences down the road. Provide all of the information you collected from witnesses and people involved in the accident. Just like in step 5, remember to never admit fault, not even to an insurance agent. Much like filing a police report, contacting your insurer helps document the crash, so it can be reviewed later. Step 7. Contact Riderz Law! If you or a loved one have been involved in a motorcycle accident or have questions regarding motorcycle insurance, feel free to send us an email or call or toll free hotline. Our experienced motorcycle lawyers are happy to talk to you. There is never a charge or obligation for our initial consultation. For more tips on how to strengthen your claim and protect your rights, click here. Many of the above steps may be difficult depending upon how seriously you may be hurt, and remember, above all else, your first concern should always be safety and medical attention for you and anyone else involved in the accident. If you have questions or concerns, contact a motorcycle accident attorney! Beware insurance companies asking for your signature, or offering you a check. This may preclude you from getting the full recovery to which you are entitled. Remember, that sweet old insurance adjuster has one priority — pay out as little as possible! In the event of a motorcycle accident, riders can take a few simple steps that can make a huge difference in their recovery. Click one of the links below to learn helpful information. Top Ten Ways to Strengthen Your Motorcycle Accident Claim. Motorcycle Accident Do’s and Don’ts. How to Make Insurance Claims After a Motorcycle Accident.